Even, or perhaps especially, in tough economic times, everyone wants to live the dream of starting his or her own business. This book tells any would-be entrepreneur exactly how to get started conceiving, starting, building, growing and most important of all, selling a successful business. 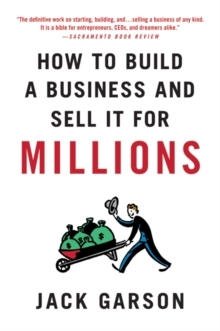 In fact, Jack Garson, a renowned lawyer and business advisor, makes "Planning to Sell: Putting the Horse in Front of the Cart" his provocative first chapter. The book then moves through real life examples and sound advice from how to assess the market for and scalability of any business idea, through staffing, culture, vision, structure, financial reporting, contracts, and dozens of other vital areas often overlooked by business hopefuls.